Cub Scouts are usually aged between eight and ten and a half years but a youngster can join from the age of seven and a half years if this is appropriate. New Cubs can either be Beavers moving on from our Colonies (Winnipeg or Yukon) or youngsters joining Scouting for the first time. If you would like to join Cornwell, please contact us. 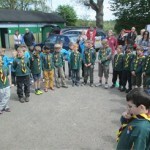 1st Old Malden has two Cub Packs (Cornwell and Kipling) offering Scouting to boys and girls. Our Cub Packs meet for about an hour and a half each week. 2016 is the centenary of the Cub Scouts, with many special events for our Cubs. 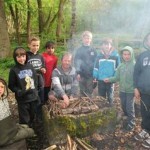 Our Cub Scouts enjoy trying lots of things such as games, arts and crafts, swimming, cooking, sports, music, exploring and many other activities. 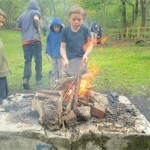 Cub Scouts get the chance to earn lots of badges and awards during their time in the Pack. Cub Scouts often go on trips and outings to places like museums, theme parks and farms. They also have the opportunity to go camping either staying in a tent or in a building. Whichever of these they go to it will be an opportunity for staying away from home and taking part in, and learning, new skills in the great outdoors. Cub Scouts also get the chance to take part in District events and activities such as Badge Days, Arts and Crafts Competition, Five-A-Side Football, Sports Day, Swimming Gala and Raksha Trophy Quiz. Whatever Cub Scouts do they always enjoy themselves, learn new things and have fun!